What is a sucky presentation? We all know the classic signs and symptoms of a presentation flop — it feels like it's running on too long and you're wasting your time (either as the presenter or an audience member). At their core, sucky presentations fail to resonate with the audience, and therefore they fail in their mission to persuade or teach. It's easy to blame the tools. Vast libraries of awful clipart and boomerang animations don't help anyone. 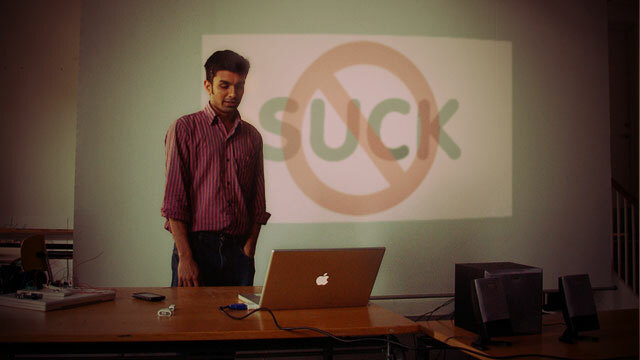 It's also easy to convince yourself that giving presentations just isn't your thing. But we all have to present at some point or another, whether you're asking for a raise or presenting a proposal to a client. That said, most people haven't studied presentation design or how to communicate effectively. So I talked to someone who has. Nancy Duarte and her amazing Duarte design firm have created over a quarter of a million presentations in the last 23 years (they're the group that helped Al Gore develop An Inconvenient Truth, and they also support several TED and PopTech conferences). Duarte says that we've definitely reaching a tipping point in the last few years when it comes to presentation design: audiences want more and expect more from us as presenters. The good news is it's not hard to learn some basic principles. At Duarte workshops, attendees re-sketch slides — offline, without PowerPoint getting in the way — to learn things like arranging things in a grid and creating contrast and emphasis. Here are a few "before" slides that I've gathered from around the web as examples of what not to do. Some presenters put everything on a slide to help them remember what they need to say, Duarte says, forgetting that you could use slide notes instead. Dense, document-like slides are best for presentations that are going to be distributed (e.g. emailed to a recipient for reading on their own time), not actually presented. Photo by Beate. Solution: Simplify. Stick to one idea per page, letting that one concept really stick into the minds of the audience members. They'll focus on your voice and what you're saying more than reading (staring at) the bullets. See the before and after example from Duarte at left. As a general rule, one should not use PowerPoint as a teleprompter. If an image is worth a thousand words, show the audience that one image, and speak the thousand words if you must, but please do not display and speak the thousand words. It's easy to fall back on the cliche images or concepts (handshake plus globe, anyone?) and clipart, especially when you're pressed for time, as most of us are. But higher-quality presentations require less automatic thinking. If you fall back on the first thing that comes to mind, chances are your competitors are doing that too. Solution: Lose the cliches. Brainstorm with others to find more clever ways to communicate your ideas. Try three or four or more options to explore the nuances of your message and relationship. If you have a slide that takes longer than 10 seconds for the audience to comprehend, it's too complex, Duarte says. Your slides should communicate your ideas and enhance what you're saying, rather than add more noise. Photo by Geetesh Bajaj. Solution: Information needs emphasis. Slides should only take three seconds to process. So even with very complex ideas, boil down the findings from that slide or split it up across multiple slides. Don't be afraid to use more slides; they're free. It's better to flow through your slides, allowing people to process them better, than to stay stagnant on one for too long. Chances are the audience is under-caffeinated, restless, and over-saturated with information already. Assume that many are in stealth mode, responding to texts and e-mails on their smartphones during the speech. But if the image (or the concise quote) on screen behind the podium has some real impact, you'll keep their attention and they'll listen to what you have to say. Duarte says the difference between a regular business person and a designer is that the designer has learned to place and scale elements appropriately for the best impact. That means no photos of bunnies or hot dogs on your slides unless they belong there, please! This also goes for random animations. Photo via InFocus. Solution:Designate elements purposely. Don't decorate slides for the sole purpose of decorating them. Duarte has a helpful checklist for testing if your presentation is more signal or noise. Also see Garr Reynold's Graphic Design Fundamentals to learn more about design basics like unity, whitespace, and colour. Finally, it doesn't matter how beautiful your presentation design is if it doesn't have a message that your audience can connect to. Many presenters out of nervousness talk to the slides, but your goal is to build a bridge between your message and the audience (and not waste their time). Photo by Duarte. Solution:Empathy for the audience. John Brubaker, an adjust professor of public speaking and communications at Maine Community College, writes that the topmost practice he teaches is to begin your presentation outline by answering from the audience's perspective: "W.I.I.F.M. - what's in it for me?" For more advice on making presentations that move people, see our previous posts on rocking your presentation with the right tools and apps. Also, feel free to share with us your PowerPoint tips or pet peeves in the comments. Nancy Duarte and her firm Duarte's experience working with global companies and thought leaders has influenced the perception of some of the world's most valuable brands and many of humanity's common causes: Apple, Cisco, Facebook, Food Network, GE, Google, Al Gore, HP, TED, Twitter, and World Bank. Her award-winning book, Resonate — Present Visual Stories that Transform Audiences, identifies hidden story structures inherent in great communication. Duarte's Slide:ology — The Art and Science of Creating Great Presentations distills over 20 years of experience communication best practices. Avital Fryman is part of a multimedia team that films, designs and edits videos, as well as handling audio production and PowerPoint design for large corporate events. John Brubaker is an adjust professor of public speaking and communications at Maine Community College Consultant, as well as a speaker, consultant and author www.CoachBru.com. I recently completed a professional leadership course through work. In order to graduate we had to present to upper management the outcomes including the ROI. To stand out I used 4 plain white slides with a single word each. That management team all know who I am and despite no figures on screen know exactly how much I saved the company last year. Simplicity really is the key.